Mikael Harutyunyan, 16, and Norayr Harutyunyan, 18, are brothers who began painting and composing music at the tender ages of 11 and 12, respectively. 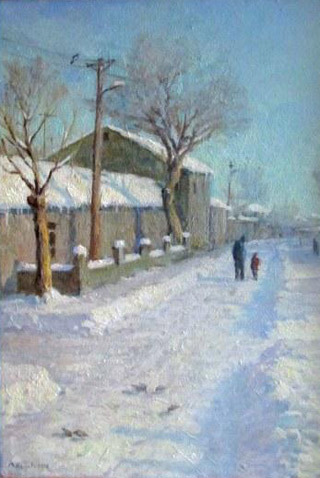 They want to make their contribution to the world of art, adding their names among the list of great Armenian artists. Mikael and Norayr are inspired by their homeland and each other but wished more attention was paid to the arts in Armenia — particularly in terms of funding. 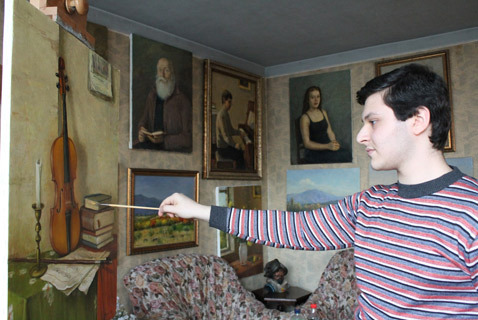 Painter Mikael Harutyunyan, 16, is getting ready for his exhibit on October 1 in Thailand. The Thai and Norwegian curators organizing the exhibit have told Mikael his exhibit might be sponsored by the queen of Thailand. All of Mikael's paintings will be sold before the exhibit. Mikael says his exhibit might be accompanied by the works of his brother, composer Norayr, 18, who has managed to write the music for two films and last year presented some of his works to Italian singer Andrea Bocelli and Deep Purple lead singer Ian Gillan. Both of the singers expressed their admiration, and afterwards Norayr wrote a piece for Bocelli. He is now waiting for the Italian tenor's response. The small house in which the brothers live in the Yerevan district of Malatia-Sebastia sees many visitors every day. The visitors are mainly artists, who go to admire the works of the two brothers who began expressing their talent at a young age. The two brothers are modest: they don't talk much; they listen attentively to others; and sometimes blush from the praise. Visitors from Germany, Belgium, the US, Russia, the Netherlands, and Switzerland come to see and purchase Mikael's work. Once, he says, a black woman from Switzerland came to their home and spoke with his parents for about 3.5 hours, convincing them to move to Switzerland. She even offered to cover all the expenses, but his parents didn't agree, saying they can't be cut off from their homeland. The brothers say that initially, Mikael played music and Norayr painted, but then their roles changed: Mikael began to paint, and Norayr to play music. All the news articles emphasize the brothers' young age. Asked if they've ever thought about what advantage their age gives them, Norayr responds: "The fact that we began to create before becoming an adult allows us to make bold experiments, knowing, it seems, that there isn't so much to lose, that more or less, there is time. Though, in general, there is never enough time. [But] in our case, it was relatively more, and that allowed us to be bold in our attempts; that is, not to follow inoffensive standards." The yellow light in the living room falls on Mikael's paintings. Here, side by side, are portraits of members of the family, neighbors, and acquaintances, homes, and still life. 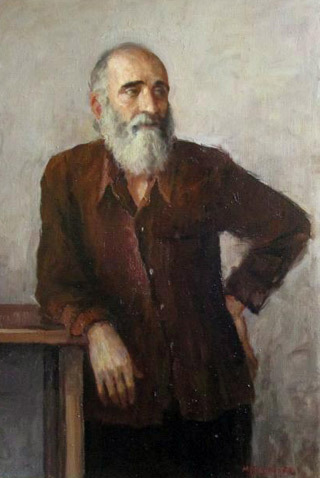 He painted many of these when he was 11–12 years old, but there are amazing, powerful strokes in the portraits, in the profound sadness in people's eyes. It's hard to imagine that the artist of these paintings is just 16 years old. He has already had a few exhibits, two of which were joint exhibit and concert programs in which Norayr participated. "We don't bother each other when we're working. Often, Norayr takes one of my paintings, puts it in front of the piano and gets inspired. The same goes for me: there are many times when I'm painting and I ask Norayr to put on his music. We help each other," says Mikael. His older brother confirms his remarks. When asked if they imagine a time when they will work separately, that they will be separated from each other, Norayr says that might happen when one of them goes to study. But mainly, they are inspired by working together. They say regardless of being busy, they very much like having guests and interacting with their friends — it's fundamental to life. The development of technology shouldn't cut people off from the spiritual because, according to Norayr, the spiritual keeps a person human. It allows him to realize his greatness and serves as an example to all. "The idea of an individual indicates greatness, importance, depth. When each person finds his individuality, it will make him happy. This is a sure thing I tell you," says Norayr. Mikael, in turn, mentions that he doesn't like the attitude of people today toward classical art. "For example, it's surprising for me that a two-year-old fills a canvas with colors and becomes an international artist. How can he understand what painting is? Today, a lot of attention is diverted from classical art. Many are painters, but they don't understand what they're doing; that is, they draw absurd lines on canvas and say that's their style. But a painter has to master the classical style because the classical is the foundation of painting," says the 16-year-old painter, whose initial paintings were in the impressionist style. That initial stage he calls his time of searching. Now he works in classical art. Neither of the brothers underwent any professional training — they are self taught. 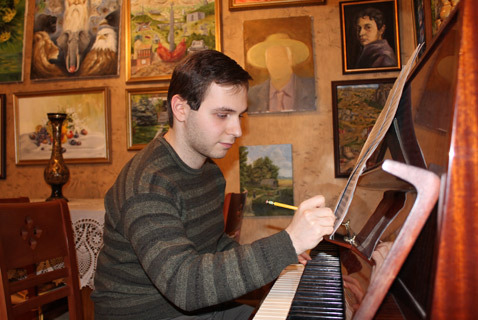 However, Norayr gets professional advice from composer Stepan Shakaryan, from whom he takes classes once a week or once every two weeks, while Mikael gets advice from painter Edward Sasun. Asked what he likes about painting, Mikael, after thinking for a while, says: "The smell of the paint, which always emanates from a painter's studio." Asked whether his family complains about the smell, he answer in the affirmative, but adds, what can they do? Norayr clarifies: "The members of our household complain about the phenomenon not Mikael. Understandably, they're chemical materials. It's just a little difficult in the winter, when it's not possible to open a window." The same question directed at Norayr, whether members of their household complain when he plays for long periods of time, receives a negative response. They don't complain, but sometimes Norayr feels that his playing is driving them nuts. That happens particularly when he's practicing music that's unfamiliar to them, since he understands that a musician has to know different genres of music well. "No, there's no such thing; everyone has become adapted to this familiar environment, to these seeming troubles. But of course it would be better if we had a common studio for Norayr and me," Mikael adds to his brother's remarks. According to Mikael, their overall goal is clear: to leave their trace in the world of art. "When I see Armenian greats in the arts, whom the world tries to imitate, we are overcome with pride. We want to also be the same, to reach great heights and bring a name to our people," he says. "That is, we, in turn, add two surnames to the list of great Armenian artists," says Norayr, then adds that it is a great individual who brings glory to a nation. "Our land gives us particular strength, and we don't want to be the type [of person] who realizes that after it's lost." Mikael, hearing his brother's words, emphasizes that he would like greater attention in Armenia to art. "We don't want to live in a foreign land," he says. At the end of the interview, he adds that playing a role in their life was the attention of their parents, who led them to art at the right time. "Among Armenians, there are many talented youth, but they have to be uncovered; you have to be delicate toward them. But often times they get lost because of inattention," says Mikael. "It's the worst thing, when a talented person disappears, and no one knows about him, or very few know about him," Norayr continues. According to the boys' father, Gevorg Harutyunyan, many in Armenia have expressed their enthusiasm for the brothers' talents: exhibits and concerts have been organized in prestigious institutions, but missing is the most important thing — financial assistance. Meanwhile, the watercolor and other paints and art supplies are gradually becoming more expensive. Harutyunyan says he regularly contacts various officials, but apart from positive remarks, their reactions don't venture to the practical. After meeting the family one is left with two questions: whether Armenian benefactors willing to help the talented brothers will be found and whether Armenia will lose two young artists with promising future prospects. P.S. Music written by Norayr can be heard here.